Couldn't make the event? Find out what you missed here! Below, you'll find recaps of our latest programming, as well as links to events we have recorded. To find out what's next, visit our programming page to see the full listing of upcoming events! Tom W. Smith Presents "Antisemitism in Contemporary America"
On April 26, 2018, Dr. Susannah Heschel presented "Human Dignity in Judaism" at Charter Oak Cultural Center in Hartford, CT. 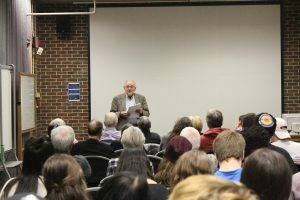 The event was made possible by the Center for Judaic Studies and Contemporary Jewish Life Gene and Georgia Mittelman Lecture in Judaic Studies, Charter Oak Cultural Center, UConn Hartford, the Humanities Institute, and the Department of Literatures, Cultures, and Languages. In this talk, Heschel explores the themes of human rights and dignity within Jewish religious texts and how they relate to the modern human experience. On April 16, 2018, Timothy Snyder (Yale) presented "The Holocaust as History and Warning" for our I. Martin and Janet M. Fierberg lecture in Judaic Studies and Annual Academic Convocation on the Holocaust. 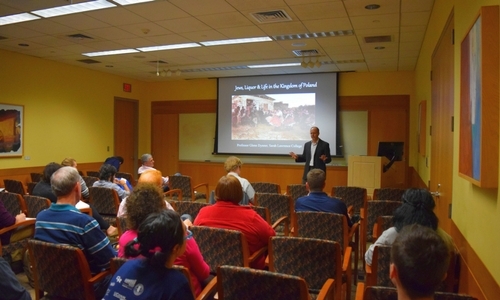 The lecture was filmed by UCSpan and was co-sponsored by the American Studies Program, the History Department, the Human Rights Institute, the Humanities Institute, the Department of Literatures, Cultures, and Languages, and the Thomas J. Dodd Research Center. University of Hartford Professor Avinoam Patt presented "The Jewish Heroes of Warsaw: The Afterlife of the Warsaw Ghetto" for the Center for Judaic Studies Faculty Colloquium series on February 6, 2018. Over forty people attended the talk which was made possible by the Irving Seliger Memorial Endowment Fund. The talk was co-sponsored by the Humanities Institute and the Department of Literatures, Cultures, and Languages. Professor Patt is the Philip D. Feltman Professor of Modern Jewish History at the Maurice Greenberg Center for Judaic Studies at the University of Hartford where he is also director of the Museum of Jewish Civilization. 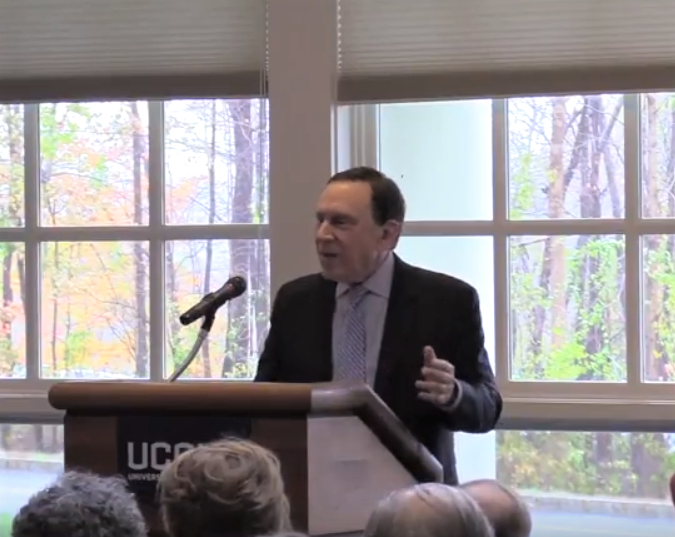 On October 29, 2017, Professor Arnold Dashefsky was honored for his distinguished career and contributions to the University of Connecticut at a ceremony followed by a lecture given by renowned historian Dr. Jonathan Sarna. Speakers at the ceremony included Interim Provost Jeremy Teitelbaum, Interim Dean of the College of Liberal Arts and Sciences Davita Glasberg, and Interim Vice Provost of Interdisciplinary Initiatives and former Director of the Center for Judaic Studies Jeffrey Shoulson. Professor Dashefsky, founder of the Center for Judaic Studies and Contemporary Jewish Life, served as the inaugural holder of the Doris and Simon Konover Chair of Judaic Studies. As director of the Center, he helped to bring nearly two million dollars in endowments to UConn and a similar sum in external grants. Though retired in 2012, Dr. Dashefsky continues to teach his popular course on the Sociology of Anti-Semitism. Following the ceremony honoring Professor Dashefsky, Dr. Jonathan Sarna presented a lecture on “The American Jewish Community in an Era of Change.” Dr. Sarna is University Professor and the Joseph H. & Belle R. Braun Professor of American Jewish History and Chair of the Hornstein Jewish Professional Leadership Program at Brandeis University. On Monday, April 24, the Center for Judaic Studies and Contemporary Jewish Life, the Human Rights Institute, and the Thomas J. Dodd Research Center sponsored the Fierberg Lecture in Judaic Studies annual Academic Convocation on the Holocaust with guest speaker Professor Samuel Kassow, history professor at Trinity College. Professor Kassow presented on a secret archive of materials collected and hidden by prisoners in the Warsaw Ghetto. All but three members of the group, Oyneg Shabes, led by historian Dr. Ringelblum perished. The collected documents and writings they produced recording Jewish life in Poland before and during the war bore witness to the Holocaust, and the archive now serves as the cultural legacy of Polish Jewry. On Tuesday, April 4, the Center for Judaic Studies and Contemporary Jewish Life and UConn's Middle East Studies Program sponsored a performance by Gili Getz entitled The Forbidden Conversation. The autobiographical one-man play depicted the actor's life in Israel and was followed by a presentation on how open conversations about the Israeli-Palestinian conflict can be conducted constructively despite disagreements in the Jewish community. Read the Daily Campus article featuring the event which describes the performance as artful and moving. On March 23, 2017, klezmer ensemble FleytMuzik performed "Farewell to the Homeland: Polyn" at Charter Oak Cultural Center as part of a joint programming effort with the UConn Center for Judaic Studies to make available unique cultural events to our community. The concert featured music from the Frand band, a klezmer band from pre-war Dubiecko, Poland. FleytMuzik created a truly mesmerizing evening as they transported the audience along a journey through the Frand band's music collection, which commemorated through musical compositions important family milestones, including a wedding, bar mitzvah, and voyage to the US. The Frand band's music was restored by FleytMuzik's leader Professor Adrianne Greenbaum from manuscripts preserved by Sharon Frant Brooks, granddaughter of band member Chaskel Frand who left Poland in 1925 with a violin case full of the band's handwritten compositions. The discovery and subsequent restoration of this collection was a major accomplishment in the revitalization of Jewish klezmer music in the wake of the devastating losses inflicted by the Nazis against the Jews of Poland to both their lives and culture. FleytMuzik presented a range of the joyful and soulful sounds of klezmer music with complex compositions and masterful artistry. Adrianne Greenbaum, who played several types of flute based on the historical period of the piece, was joined by world-class musicians Michael Alpert, Pete Rushefsky, Jake Shulman-Ment, Brian Glassman, and guest, UConn adjunct woodwind specialist, Walter "Zev" Mamlok. 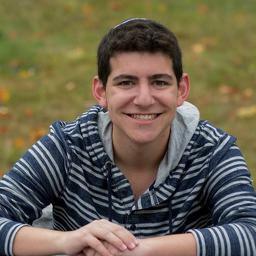 Nathan Schachter, UConn sophomore, reflects on his experience as a member of the selection committee for the 2nd Annual Jewish Playwriting Contest. This past February, I had the opportunity to sit on the selection committee for the 2nd Annual Hartford Jewish Playwriting Contest. The selection committee included community members at Charter Oak Cultural Center and UConn’s Center for Judaic Studies and Contemporary Jewish Life. We selected 3 plays from a pool of 10 that we wanted to see continue on to the next round. I was asked by Professor Jeffrey Shoulson of the Center for Judaic Studies to sit on this committee, and I am extremely fortunate to have done so. Throughout the process, of selecting the top three plays, it was eye-opening to see the amount of new Jewish work that is being produced around us today. In reading the plays I was assigned to read, I was challenged to think about what it means to be Jewish in the 21st century. I was immersed in the conversations among the committee that came out of these readings, as we discussed what worked, what didn’t, which plays were our favorites, and why. Being the only student on the committee, it was interesting to hear what the other members, who had much more maturity, life and wisdom on me, both artistically and Jewishly, had to say on the topic. On February 16, I left campus and attended the Jewish Playwriting Contest at Charter Oak Cultural Center in Hartford. There, our top 3 plays were performed in front of an audience, ranging from non-Jewish prospects to UConn’s own acting students. Using text-in votes, we all decided on our favorite play that would be moving on in the 2017 Jewish Play Project Festival in New York City in April, where the ultimate winner will be given a chance for their play to be further developed and workshopped. I am looking forward to see where our favorite, Book of Esther, makes it in the rest of the competition! 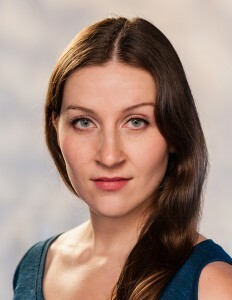 Read more about Gina Stevensen and Book of Esther on the Jewish Plays Project website! 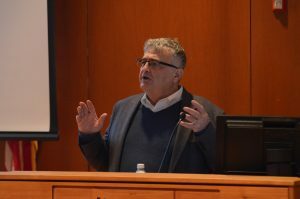 Dov Waxman, professor of political science, international affairs and Israel studies at Northeastern University presented “Trouble in the Tribe: The American Jewish Conflict over Israel” on March 9. Professor Waxman discussed three changes that caused a shift in American Jews becoming more critical of Israeli politics: Israeli political ideals shifting to the right, the Arab-Israeli conflict, and the changes in how the conflict is conducted on both sides. Professor Waxman also explored the differing views on Israel within the Jewish community itself, explaining that Orthodox Jews tended to be more conservative and non-Orthodox Jews were more liberal. 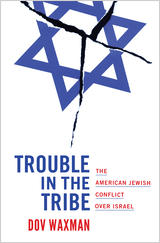 This political divide also accounts for the shifting opinion of Israel with American Jewish communities. For more on this event, check out the Daily Campus article that covered our talk. 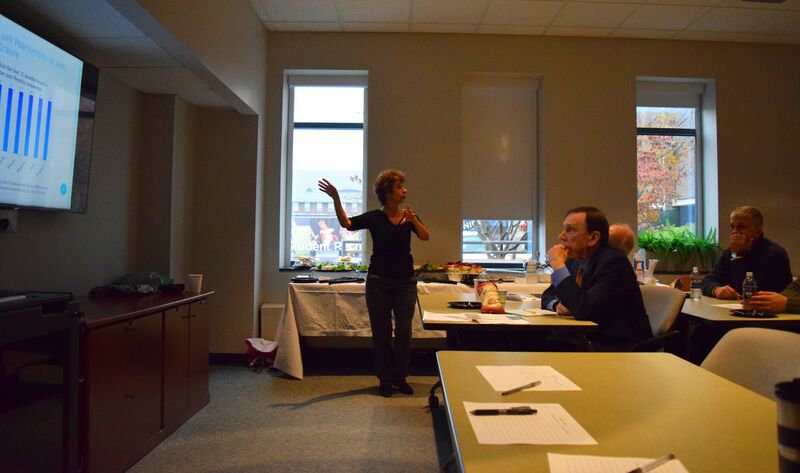 In remembrance of Kristallnacht, Professor Ariela Keysar of Trinity College presented two talks on anti-Semitism. Professor Keysar's colloquium featured "Variations of Anti-Semitism in a Global Perspective: Conceptual and Methodological Issues," and her public lecture was titled "International Comparison of Anti-Semitism on Campus: Why Are Women More Likely to Be Targeted?" In Professor Keysar's first event, she quoted an America Jewish college student who said in 2014 "subtle anti-Semitism - it's the last socially acceptable form of racism." Professor Keysar went on to define anti-Semitism: a certain perception of Jews, which may be expressed as hatred towards Jews. There can be both rhetorical and physical manifestation of anti-Semitism; they can be directed towards Jewish or non-Jewish individuals and/or their property, or toward Jewish community institutions and religious facilities. Professor Keysar's presentation asked to what extent Jews' experiences and perceptions of anti-Semitism vary by country, through the lens of the victims? Research shows, as Professor Keysar explained, that experiences and perceptions of anti-Semitism in Europe have increased. Especially in Hungary, within the last 12 months Jews have personally heard a non-Jew utter anti-Semitic comments, heard that "Jews are responsible for the current economic crises," heard non-Jewish people suggest that the Holocaust is a myth or has been exaggerated, and heard non-Jewish people suggest that the interests of Jews in their country are different from the interests of the rest of the population. The survey that Professor Keysar cited also found that more Jews in Sweden and France than in any other of the investigated European countries claim to have been physically attacked because they are Jews. 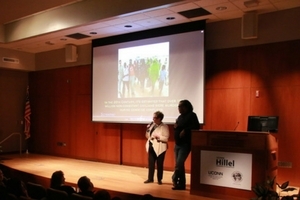 UConn Hillel, the Center for Judaic Studies and Contemporary Jewish Life, and the UNESCO Chair and Institute for Comparative Human Rights were honored to host Director Michael King and Executive Producer Joyce Mandell of the award-winning film The Rescuers. The film was screened for the audience, followed by a question and answer session with King and Mandell. The film chronicles the journey of Stephanie Nyombayire, a young Rwandan anti-genocide activist, and Sir Martin Gilbert, a leading Holocaust historian, as they travel across Europe and elsewhere interviewing survivors and descendants of the diplomats who rescued thousands of Jews from the Nazis. The film explores the connection between the Holocaust and other genocides, such as in Darfur. One story featured in the documentary was that of Aristides de Sousa Mendes, a French diplomat who worked himself into physical exhaustion processing visas for Jewish refugees attempting to enter Spain. Additionally, Sousa Mendes was able to have the fees associated with documentation waived, which allowed more Jewish refugees the opportunity to come to Spain. Sousa Mendas was recognized by Israel as one of the Righteous Among the Nations in 1966, the first diplomat to be honored in this way. The documentary also followed Georg Ferdinand Duckwitz, an attaché for the Nazis. Upon finding out that Danish Jews were to be deported, Duckwitz coordinated with the Swedish prime minister to take in 95 percent of Jews in Denmark, totaling over 7,900 people. Similar to Sousa Mendas, he was named Righteous Among the Nations by Israel in 1971. The film viewing was followed by a talkback with King and Mandell. King commented on how Stephanie’s story was important to tell. “She shows that genocide is still happening,” said King. We thank Joyce Mandell and Michael King and all those who came out to this event! Up-and-coming comedian Jesse Appell visited UConn on November 16 as part of his college circuit tour. He discussed his experiences of being a Jewish-American comedian living in China and the ways humor can transcend culture by tapping into commonalities people share. Appell’s visit was the final event of our Jewish Humor Series and was made possible by UConn’s Center for Judaic Studies and Contemporary Jewish Life, the Maurice Greenberg Center for Judaic Studies at the University of Hartford, UConn’s Asian and Asian American Studies Institute, and UConn’s Asian American Cultural Center. 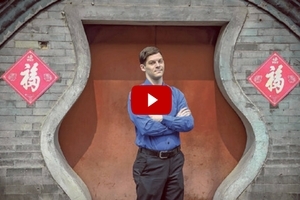 A graduate of Brandeis University, Jesse continued his studies in Beijing in 2012 where his receipt of a Critical Language Enhancement Award made possible intensive language study, and a Fulbright scholarship funded his research on Chinese comedy. His unique brand of intercultural comedy mixes Jewish humor with the traditional art of Xiangsheng, a 150-year-old Chinese comedy folk art. The Center for Judaic Studies hosted Professor Glenn Dynner of Sarah Lawrence College on October 20. He presented his talk, “Jews, Liquor, and Life in Eastern Europe” to an enthusiastic audience in the Class of 1947 Room in the Homer Babbidge Library. Dynner showed how Eastern Europe became a safe haven for Jews in the 1800s and how changes in social dynamics later forced them out. According to Dynner, while Jews and Christians in the 1800s did not enjoy coexistence in a social sense, they came together through the Jewish tavern. When grain exports fell in Poland, the excess grain became the basis for a burgeoning vodka business. Because the nobility believed Jews were less likely to drink the product than Catholics, who were known to drink socially after events like church, Jews were granted rights to own taverns. Using this general view of Jewish sobriety, Jewish families were able to come to Poland and make money in the tavern business. Problems later arose, as Dynner described, when vodka became stronger and cheaper due to advances in distilling techniques. Drunkenness became rampant and it fostered a tone of cultural superiority, where citizens who frequented the taverns were under the impression that “the Jew is sober because he wants to exploit you.” Anti-Semitism increased in these communities until eventually the Tsars drove the Jews out of the liquor trade by increasing taxes on taverns, or by expelling them to the countryside in Pogroms. They saw the Jews as the cause for an epidemic of alcoholism, rather than the nobility who supplied them with the alcohol. However, all this did was push the tavern system underground, Dynner explained. 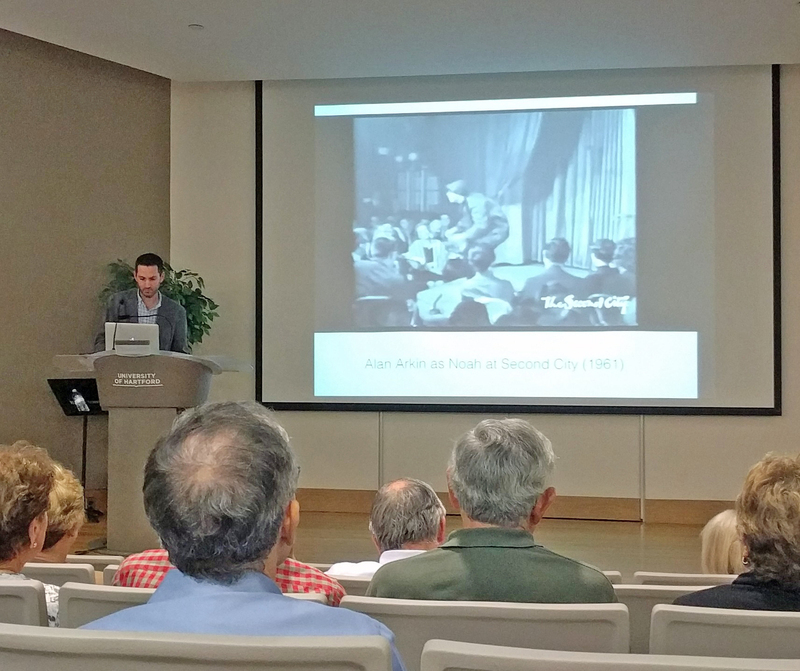 Professor Dynner’s presentations showed the audience the utility of applying historical lessons in modern times. We thank Professor Dynner for coming out and educating us about the Eastern European Jewish experience! 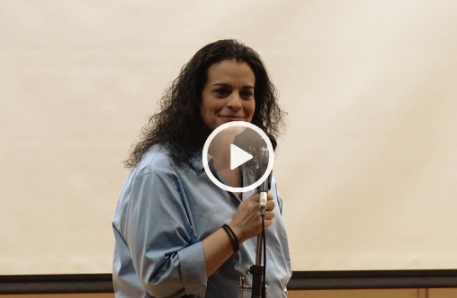 On October 19, noted stand-up comic Jessica Kirson spoke on the topic of Jewish comedy at the University of Hartford as the second feature in a three-part Jewish Humor Series that the Center for Judaic Studies is participating in this fall with the Maurice Greenberg Center for Judaic Studies at the University of Hartford. Students, faculty, and community members were treated to a fun night as they listened to Kirson's unique take on life and Jewish humor. Jessica Kirson has twice appeared on The Tonight Show with Jay Leno, The View, HBO, and will be featured in Robert De Niro's upcoming movie The Comedian set to be released this December. If you missed the event, please watch it here! 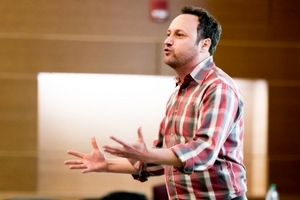 The final event in the Jewish Humor Series will take place on November 16 at 7pm when Fulbright scholar and comedian Jesse Appell presents on Chinese and Jewish humor on the UConn campus, Laurel Hall, room 102. Today’s comedy, from stand-up to movies to TV, is dominated by both Jewish entertainers and producers. What accounts for this worldwide success? On Wednesday, September 14, Josh Lambert, Academic Director of the Yiddish Book Center and visiting assistant professor of English at the University of Massachusetts, Amherst, examined the question in the first talk of this fall’s Jewish Humor Lecture Series developed by the University of Hartford's Maurice Greenberg Center for Judaic Studies and co-sponsored by UConn’s Center for Judaic Studies and Contemporary Jewish Life. In his presentation, “The Roots of Jewish Humor,” Professor Lambert explored the possible reasons for the notable, modern-day success of Jewish comics, ultimately rejecting the idea that today’s comics are tapping into and perpetuating an ancient tradition, largely because no such coherent tradition of comedy can be found in the textual sources of the Talmud and Hebrew Bible. Instead, Professor Lambert attributed much of the comedic success of performers such as Sarah Silverman and Adam Sandler and producers such as Judd Apatow and Carl Reiner to the fact that Jews are fundamentally connected to the most deeply valued Western traditions while remaining as outsiders to the majority culture. This allows Jewish comedians to provide a unique and different take on subject matter that is ubiquitous, engendering the humor that members of Western culture can relate to. 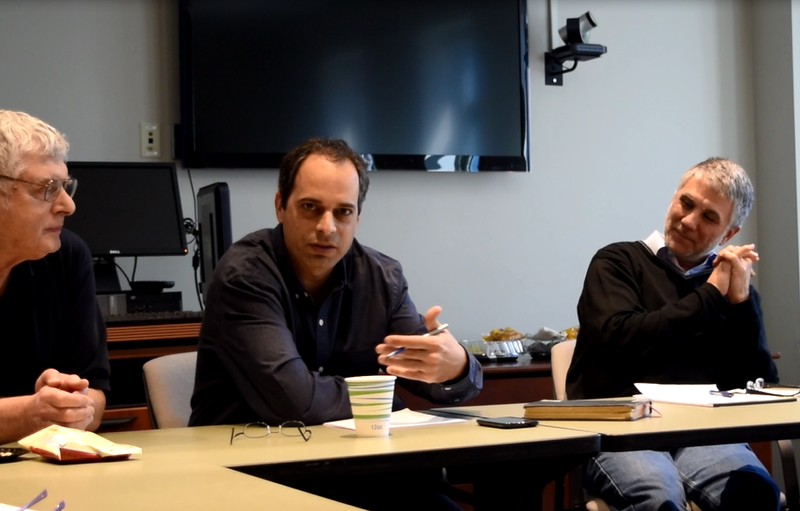 Professor Hotam Presents "Transgression in Modern Jewish Thought"
Professor Yotam Hotam, the 2015 Horace W. Goldsmith Visiting Professor in Judaic Studies at Yale, presented “‘Transgression’ in Modern Jewish Thought” at our recent, April 20, faculty colloquium. Dr. Hotam is a lecturer in the department of Learning, Instruction and Teacher Education at the University of Haifa; and his research focuses on the intersections between secularism, religion, and theology in modern European and modern Jewish thought. In his highly enjoyable presentation, Dr. Hotam examined Freud’s 1905 work, The Joke and its Relation to the Unconscious, and argued that the book, which consisted of a large collection of Freud’s “Jewish jokes,” revealed the way Freud navigated his dual identity as a lawful Jew whose parents hailed from Galicia and a secular modernist who rejected obedience to Jewish law. As Dr. Hotam explained, jokes act as a social mechanism to defy the norms of society by expressing inhibited or suppressed desires, but they also preserve the norms they attack. Freud’s jokes, according to Dr. Hotam, served much the same function in preserving his Jewish identity. Dr. Hotam is the author of Modern Gnosis and Zionism: The Crisis of Culture, Life Philosophy and Jewish National Thought (Routledge 2013) and a co-editor of New Social Foundations for Education: Education in Post-Secular Society (Peter Lang 2015). Currently, he is working on a book project that explores the relation between the concepts of critique and theology in the writings of leading modern Jewish thinkers such as Sigmund Freud, Walter Benjamin, and Theodor Adorno. We look forward to learning more about his work! An amazing performance by the Guy Mendilow Ensemble was held at the Charter Oak Cultural Center in Hartford on April 7. The Guy Mendilow Ensemble is an award-winning quintet with a cast of world-class players who mesmerized the audience with their skill in playing a wide variety of instruments, including the Berimbau, Jaw Harps, and Thumb Piano. The unique performance, entitled "Tales from the Forgotten Kingdom," combined storytelling with the music of the Sephardic diaspora, transporting the audience through time and place from Sarajevo to Jerusalem. The concert was sponsored by the Charter Oak Cultural Center and the Center for Judaic Studies and Contemporary Jewish Life. 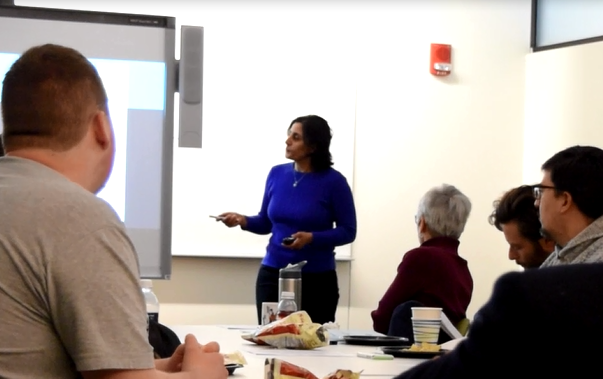 On March 23, at our faculty colloquium, Maha Darawsha, lecturer in Arabic at UConn, presented on her exciting discovery this past summer in Nazareth, Israel of a mosaic floor thought to be from one of the earliest churches in Christianity. Darawsha, whose work is in collaboration with the University of Hartford’s Greenberg Center for Judaic Studies, along with Professor Richard Freund of the University of Hartford and Shalom Yanklovitz of Haifa University, led a team of archaeologists in excavating near the current Greek Orthodox Church of the Annunciation. The Church of the Annunciation, so named because it is said to be built above the spring where the Virgin Mary was drawing water when the angel Gabriel revealed to her that she would bear the Son of God, lies just south of the excavation site. Darawsha, originally from a village just outside of Nazareth, has been researching the project since 2003 and believes that they have found the exact site of Mary’s well, upon which the original Church of the Annunciation was constructed. Ground penetrating radar, along with the primary source material that records the existence of the early Byzantine era church, helped the team to uncover the site where the mosaic, believed to date to the fourth century, was found. Darawsha holds a B.A. from the University of Haifa in Archaeology and an M.A. in Judaic Studies from UConn. She will return to the excavation site in the 2016 summer season and hopes to uncover more of the building and an extension of the mosaic which is decorated with crosses and other Christian iconography. We look forward to hearing more about these exciting discoveries as the excavation continues!